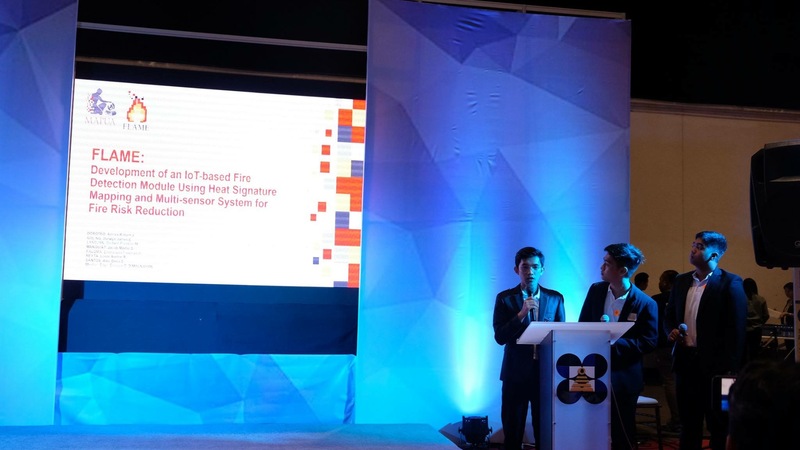 Young innovators of Mapúa University showcased their research on fire detection and monitoring in the 2018 National Science and Technology Week forum last July 18 at the World Trade Center. 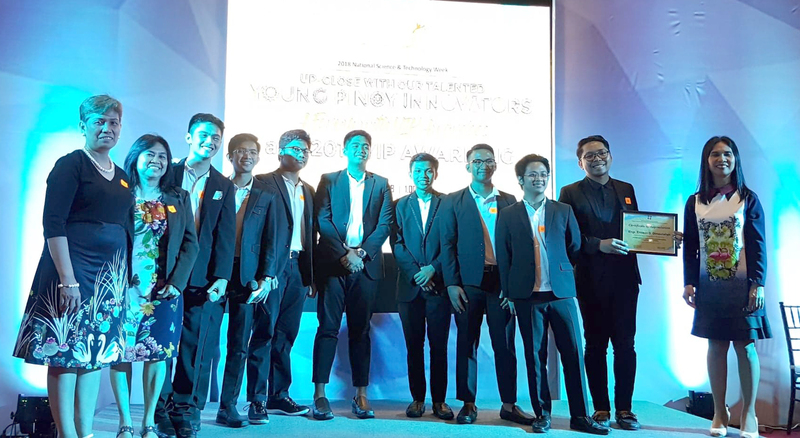 Team FLAME, one of the seven 2017 Young Innovators Program (YIP) awardees, was composed of seven Grade 12 students of the Mapúa Senior High School taking up Science, Technology, Engineering, and Mathematics (STEM) education, namely, Jacob Martin Manguiat, Emmanuel Freeman Paloma, Alec Denji Santos, Darwyn James Goling, Louie Andrie Reyta, Adrian Robert Doroteo, and Franklin Godwin Lañojan. The team developed Project FLAME or Project Fire Luminosity Alert and Multisensory Equipment. Powered by the Internet of Things and the Artificial Neural Network technologies, Project FLAME is a fire-detecting equipment that uses heat signature mapping and multi-sensory system designed to reduce fire incidents. It uses video image analysis and creates an accurate early detection system that will send alerts and warnings to the Bureau of Fire Protection (BFP) for a faster fire incident response. The accuracy of the equipment is based on its double trigger feature, which will only send an alarm when heat irregularities are shown in the heat map and the fire hazard sensor is triggered. The Internet of Things is a new technology that wirelessly connects devices and sensors over the Internet. It is an open technology that creates possibilities in big data analytics allowing users to analyze data coming from different sensors and predictions. “During our disaster risk reduction management class, we saw the trend and the rate of fire incidents in the country, and it is increasing every year. Using our knowledge in our own field of expertise, we developed Project FLAME,” said Emmanuel Freeman Paloma, team member. Team FLAME started as the 2017 robotics team of Mapúa Senior High School. The students transitioned into conducting research and innovation projects after they were granted funding by the Department of Science and Technology - Philippine Council for Industry, Energy and Emerging Technology Research and Development (DOST-PCIEERD) through Young Innovators Program, which provides support to young innovators and researchers who can be promising scientists and engineers of the future. The council’s new program paves the way to the increase in research publications and the development of innovative technologies and devices in the Philippines. “The energy of our young students to do research is intact. They think outside the box, and are not easily distracted. You just have to mentor them,” said Engr. Ericson Dimaunahan, physics instructor and adviser of Team FLAME. Team FLAME’s project took one year to finish. The students had to undergo trainings in public speaking and learn technical programming in the duration of the research. It was completed in June 2018 and was submitted to the Department of Science and Technology (DOST) for implementation. “Our adviser trained us to dig deeper and to do research like a true researcher. He guided us throughout the whole research and instructed us on what areas to focus and study,” said Darwyn James Goling, team member. Mapúa Senior High School and college’s trainings for research are synergized to ensure the quality of research outputs of the high school students and to expose them to the rich and diversified research culture of the University. “Our research advisers are experienced researchers in the college level. This is the advantage of having our college manpower in our research projects. We are benefiting in terms of having a replication of the culture and practices in the collegiate level,” said Dr. Lilibeth Sabino, principal of Mapúa Senior High School. Mapúa’s existing tie-ups with major industries allow its students to undergo immersion and eventually come up with relevant and industry-responsive studies. SHS is also initiating its external links with other schools abroad for global research trainings and collaborations. In 2017, the University held its first Senior High School research colloquium, which generated positive response from both students and teachers. Though the majority of the research studies are science-based, students are encouraged to pursue studies in the areas of arts, education, and social sciences. “We believe in the diversity of our students, and through research, we want them to grow in their chosen field,” said Dr. Sabino. The members of FLAME are currently in their first year in college. Six out of the seven members stayed in Mapúa for their undergraduate studies taking up electrical engineering, electronics engineering, and computer engineering. The students opt to remain as a team and are planning to do another research and join other innovation competitions in the country and abroad.